Who hasn’t looked at a Mini-14 or Mini-30 rifle and thought, man this baby would be a blast on full-auto? Well, it would seem great minds think alike because Sturm Ruger did just that back in the 1990s when they made a little-known variant built around this concept. The gun was the Ruger AC556, and it’s what is lovingly referred to in the full auto circles as a “buzzsaw”. Ruger started work on the variant in 1978, specifically targeting government sales. 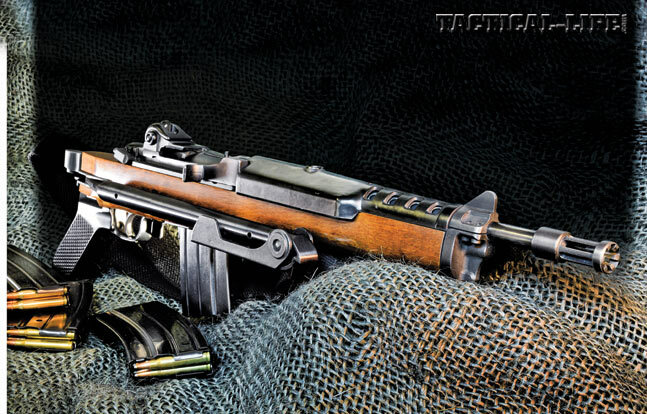 In the back of his mind, Bill Ruger had always believed the Mini-14 could have competed as a valid military rifle (a sentiment shared by Colonel Jeff Cooper) if it just had the right features. 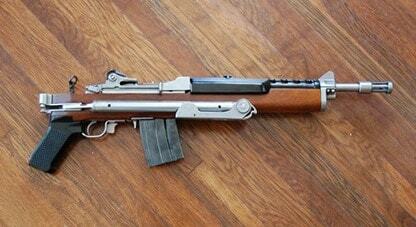 Taking the standard Mini-14 layout as an example, with its CNC made chrome-molybdenum steel barrel and breech and extensive use of music-wire coil springs, Ruger made a few changes. Ruger AC556K. Note the selector switch by the rear sight. First, the AC556 has a completely different receiver, not to mention fire control group. The receivers had to be slightly longer to fit the select-fire mode switch at its rear part. This selector moves from regular semi-auto fire, to 3-round burst, to full auto with a flick of the dial. It was located to the right hand side of the rear sight, with all the way back being rock and roll. The gun still maintained its standard Mini-14/30 safety lever in the trigger guard. The fixed-piston gas system was beefed up a little, as it, in its time, was one of the few select-fire 5.56mm ‘rod’ guns on the market. The end of the barrel held a NATO standard flash hider that doubled as a grenade launcher for rifle grenades and recoil damper. On the front sight band was a bayonet mount that could take the same M-7 knife style blade as carried by the M16 rifle. Not all versions came with the bayonet option and those that did would be marked (GB) for ‘government bayonet’. This is why you see the police intended Mini-14GB out there, but that is another article. The gun was produced in two flavors for commandos looking for different things. The first gun, the standard AC-556, has a 7.3-pound empty weight (7.8 loaded with a 20-round mag), and was 38.75-inches overall with an 18.5-inch barrel. The second was the AC-556K, a chopped down version. Slightly heavier at 7.9-pounds loaded, it was much shorter at just 33.5-inches with its folding stock open, and right at 24 with it folded neatly out of the way. The fact that it had a 10-inch barrel helped a lot. These have also been referred to in some publications as AC-556F models (for folder). Stainless sub variants of each were differentiated by adding another ‘K’ to the front of the model to where a stainless AC-556K would be a KAK-556K. Clear as mud? Introduced in 1986 as the private sale of Class III full-auto firearms was being made illegal by the Hughes Amendment, the company marketed these guns only to police and military customers. As a ‘budget’ alternative to Colt-made M16 rifles, the gun caught on with some agencies and the company had enough sales to keep the line open for almost two decades. The fact that the gun wasn’t an ‘evil looking black rifle’ made it a good choice for departments with image issues or a finicky local government. It wasn’t until 1999 that the company pulled the plug on these neat little rippers. On the transferable NFA market, these guns start at about $6,000 and move very rapidly higher from there. A word of warning though: due to incorrect cleaning, users often made these guns non-functional. Specifically, owners can break their AC556s by putting the trigger group back into the gun after wrong disassembly. The selector must be in the upright or semi-auto position when inserting the trigger group. If not, it will bend part of the group and the gun will have to be repaired. And this can be a problem because Ruger stopped working on these guns in 2009 and no longer supports them in any way. About 90% of the internals swap out for regular Mini-14 parts, but odds are those arent the ones you broke. A few dealers specialize in these guns including David Spiwak who even has a copy of the 27-page manual for the AC556 up on his site in pdf form. Of course, you can always get lucky. Law enforcement agencies have a tendency to get rid of ‘old’ guns regardless of how much range time they have gotten as administrations change periodically and spring cleaning commences. A pair (yes, pair) of functioning (yes, they really worked) AC556s were sold through the US Government’s auction system last month for a total of $1,165.50. The agency that owned them, the Muhlenberg Township, PA PD stated, “The rifles were acquired from another agency. Past use information is not available.” The transferable guns were NFA and had their 3-round burst and full auto selector switches operable, which are sure to make whatever Class III dealer lucked into them very happy.